Watch cases come in various flavors: steel, titanium, ceramics, aluminum, white gold, yellow gold, pink gold, platinum, silver, plastic, rubber, palladium, bronze, and even wood. Case materials have different properties: Some are hypoallergenic like palladium, some super light like titanium, and some nearly indestructible, like the urethane resin that Casio G-Shocks are made from. Some case materials are wildly more expensive than others: The same Grand Seiko costs $5,700 in steel (SBGW253), $17,200 in yellow gold (SBGW252), and $30,600 in platinum (SBGW251) for instance. Few people can spot whether a watch is made from steel, silver, white gold, or platinum. Even when you’re studying a watch, it’s difficult to know what the material is. For all practical purposes, unless the watch owner’s wearing a button that says, “My watch is made of platinum,” nobody except for that watch wearer knows. So why not wear a watch that’s made from a material that’s an amalgam of metal and hope? If somebody happens to ask, “Is that a platinum watch?” you can answer, “No. It’s made from an even rarer, more incredible material: Humanium Metal, metal from melted-down illegal firearms.” Now you have a story to tell. And who knows, you may have created a convert to watch collecting. TRIWA comes in 34 mm and 39 mm flavors. Only the 39 mm Hu39-DA is available as an automatic; the 34 mm is quartz-only. The guts of the Hu39-DA is an automatic Miyota 9015 movement. TRIWAs are attractive three-hand watches with a date display, and a touch of bold. TRIWA watches have sapphire crystals, luminous hands, punched dial indices, and acceptable waterproofness for daily use (10 ATM for the 39 mm model, 5 ATM for the 34 mm quartz.) You can choose from light or dark dials, as well as from various straps. The Kickstarter campaign closes soon, so if you want one visit here without delay. 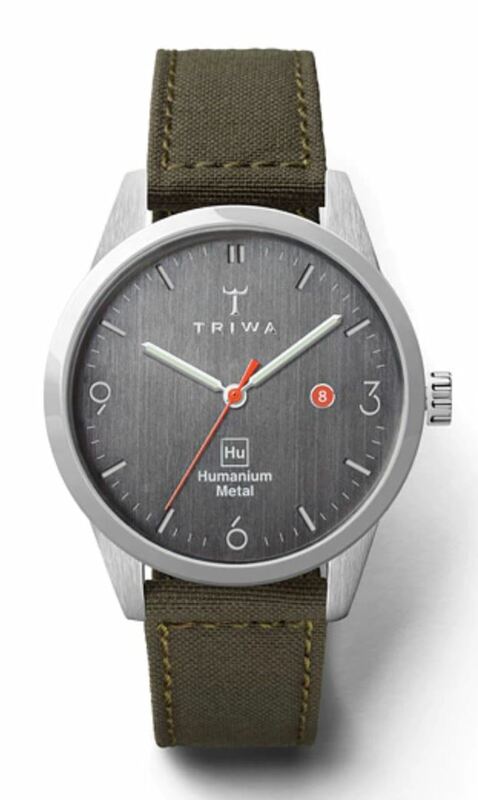 TRIWA watches aren’t expensive: about $475 for the 39 mm automatic model.